LMS brake van 731411, FK 13436 and class 08 D4167. High time we finished repainting the wasp stripes. 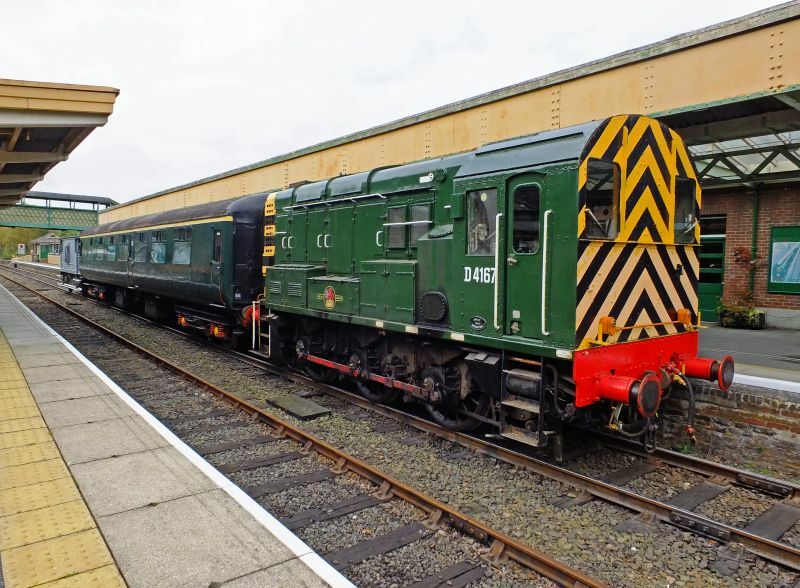 D4167 is a class 08 0-6-0 diesel shunter, TOPS number 08937, named 'Bluebell Mel', although the nameplates are currently (Dec 2015) removed for repair. Built in 1962 in Darlington, it has spent all its operational life in the South West, at Plymouth, Newton Abbot, Exeter or Meldon. It has dual brakes, and is often used for passenger services on the DR.
A photo of it in service in the early days of the Dartmoor Railway can be seen here. It's the fifth photo down the page.